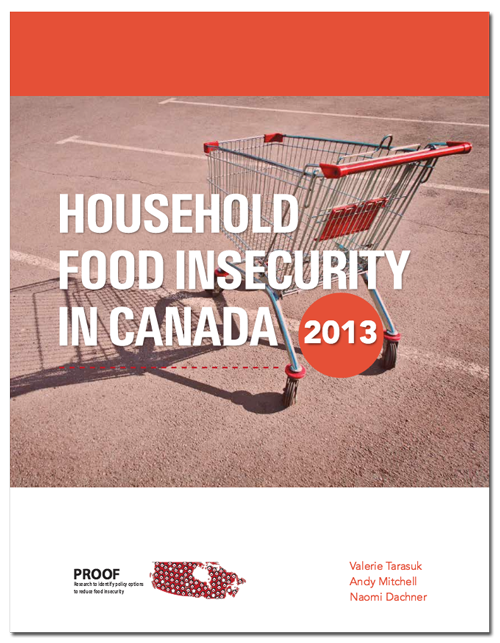 Household food insecurity, inadequate or insecure access to food because of financial constraints, is a significant social and health problem in Canada. Not all provinces and territories chose to measure food insecurity in 2013 but among those that did, the problem appears to have remained persistently high. When the results for the participating jurisdictions - Alberta, Saskatchewan, Ontario, Quebec, New Brunswick, Nova Scotia, Prince Edward Island, the Northwest Territories, and Nunavut – are considered together, 12.5% of households experienced some level of food insecurity during the previous 12 months in 2013. This represents 1.4 million households, including 2.4 million adults and nearly 1 million children under the age of 18. This means that 17.4% of children under 18, or more than 1 in 6 lived in households that experienced food insecurity in 2013. Food insecurity was most prevalent in Canada’s North (especially Nunavut) and the Maritimes in 2013. With the exception of Quebec, food insecurity prevalence rose or held steady in every province and territory with data in 2013. The lowest rates of food insecurity were found in Alberta and Quebec, but even in these provinces, the rate of food insecurity was over 11%.